Captain Jack Sparrow (Johnny Depp) returns, thrown into a race against the Spanish to discover and claim the fabled Fountain of Youth. It is a race that will see him reunited with former lover Angelica (Penelope Cruz) and rival pirate Captain Hector Barbossa (Geoffrey Rush), as well as bring him face to face with Edward “Blackbeard” Teach (Ian McShane) – the murderous pirate that all other pirates fear to meet. 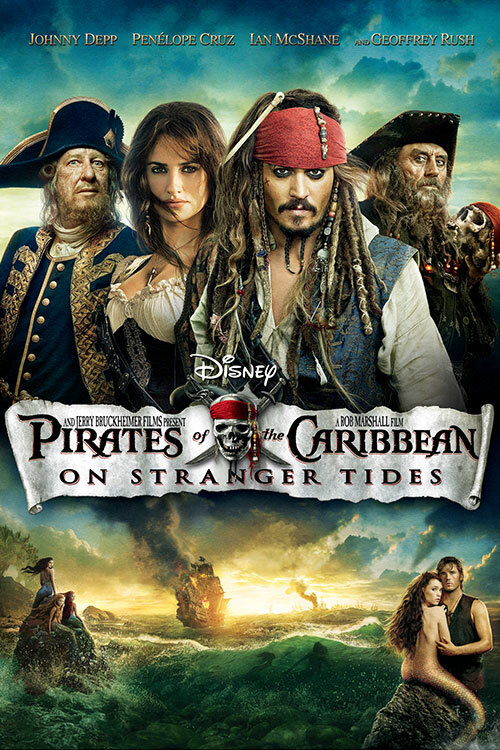 Pirates of the Caribbean: On Stranger Tides instinctively feels like an unnecessary sequel. Its predecessor, At World’s End, was a fairly closed-off climax to the first three films. It had numerous faults, yet did feel rather definitively to the end of a story. The futures of protagonists Will Turner and Elizabeth Swann were wrapped up, the villains were defeated, and the supporting characters of Jack Sparrow and Hector Barbossa sailed off into the horizon for further adventures. I remain unconvinced we needed to see those further adventures. Nonetheless, with a clearly supportive market for the franchise Disney proceeded undeterred. Both Depp and Rush were convinced to return, departing director Gore Verbinski was replaced with Rob Marshall (Chicago), and Tim Powers’ excellent fantasy novel On Stranger Tides was licensed to be vaguely strip-mined for plot elements (and allegedly to prevent him filing a lawsuit over elements of the book that may have surreptitiously found their way into The Curse of the Black Pearl). The final result is not an overly impressive film, but it is admittedly a fairly harmless and amiable one. The problem with the second and third Pirates films was that they were packed with a little too much content, and had a tendency to bloat as a result. The problem with the fourth is arguably that there is not enough. It feels a superficial and throwaway effort that does not bother to expand upon what content it does deliver. On paper a sea-faring fantasy-horror with zombies, homicidal mermaids, haunted ships, eternal youth, three rival pirate captains and the combined British and Spanish navies sounds like a recipe for something tremendous. Instead writers Ted Elliot and Terry Rossio, along with Marshall directing, provide something curiously modest in scope. On Stranger Tides struggles with transforming Jack Sparrow from key supporting figure to protagonist. The character is simply too exaggerated and loopy to fit the role. To use a Star Wars analogy, Sparrow is Han Solo to Will Turner’s Luke Skywalker, and while he is – when Depp restrains his excesses a little – great entertainment, he is not well-suited to driving a traditional adventure narrative. Weirdly the film does include a great candidate for the protagonist role: Philip Swift (Sam Claflin), an idealistic young preacher who struggles to retain his faith when faced with all manner of monsters and evils. By focusing the movie so much on Sparrow, Swift gets remarkably short-changed. We never properly get to know the character, and are denied therefore the chance to fully engage with him. A much better film would have replaced the complicated and Sparrow-centric first act and spent some time on Swift’s capture by Blackbeard instead. That would have ensured a more suitable viewpoint character, enriched the film generally, and made for a more satisfying film by denying the audience the gratification of seeing Sparrow’s return until the beginning of the second act – already a prisoner himself on Blackbeard’s ship. To the film’s credit, Ian McShane makes a tremendous villain as Blackbeard. Mean-spirited, cruel and charmingly sardonic, he presents a sharp contrast to both Sparrow and Barbossa. McShane is one of the best male actors working today, and has a peculiar knack for delivering his dialogue as if it’s Shakespeare. He is slightly under-used, which is a shame, and he never really gets the opportunity for a genuinely impressive sword fight – to be honest, in this film no one does – but he really does enhance every scene that he is in. It is also nice to see Penelope Cruz join the cast as Angelica, an untrustworthy former lover of Sparrow’s who claims to be Blackbeard’s daughter. These sorts of Hollywood blockbusters typically struggle with developing female roles, and hers is a reasonably good one. The film’s only other key female character – the mermaid Syrena (Àstrid Bergès-Frisbey) – is effective, but again under-utilised. The only other key addition to the cast, the pirate crew member Scrum (Stephen Merchant), feels a poor substitute for the previous key crew members Pintel and Ragetti; both McKenzie Crook and Lee Arenberg declined to return for a fourth film. As for the two returning leads, Depp continues his exaggerated portrayal of Sparrow throughout while Geoffrey Rush benefits from a much stronger story arc. The sadness of Depp’s performance is that when he eases back a little it becomes quite a wonderful blend of heroism and eccentricity. There is a huge potential in what he does, but he keeps self-sabotaging. As for Rush, events between the last film and this one have given him a much darker and more murderous edge, and he plays it out brilliantly. He was always my favourite character in the franchise, and On Stranger Tides does nothing but confirm that opinion. Given that almost the entire cast has changed around them – Kevin McNally returns as Mr Gibbs, but that’s almost it – there is a pleasing familiarity when the two share a scene. Their comic timing works, and there seems a genuine competitive friendship between them. Together they provide several of the film’s best scenes. Ultimately this is a fairly ordinary film peppered with some genuinely great scenes and moments. After the enormous climax of At World’s End, however, it struggles to feel like anything other than a pale epilogue. For the franchise to succeed into the future – Dead Men Tell No Tales opens worldwide within a couple of months – future writers and directors will need to take a lot more care in ensuring the depth, tone and character focus is much more carefully applied.